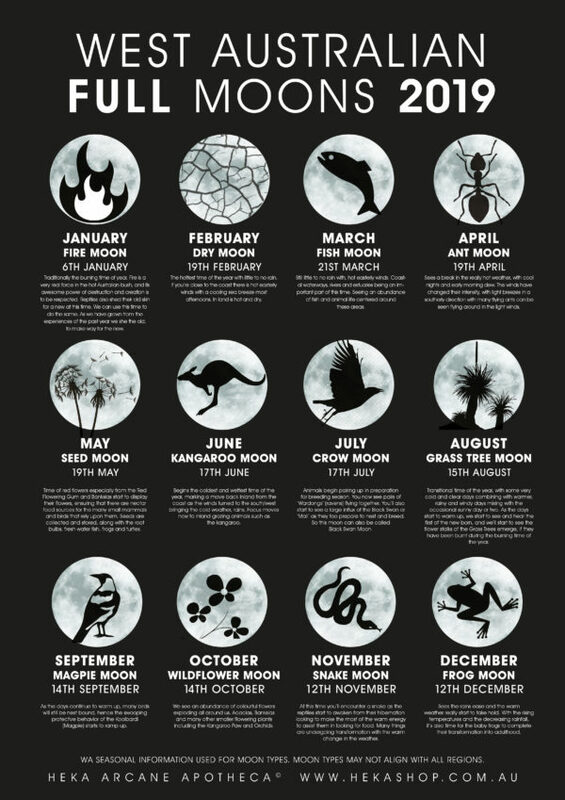 Full Moon names and dates for Western Australia. A3 (297 x 420mm) Black and White Poster. Categories: CURIOS, Home & Altar, On Sale! I have created this poster, because of my increasing frustration at seeing so much information about the Moon names, used by many Southern Hemisphere, spiritual people, being a direct copy and paste of Indigenous American moon names, that relate, not only to different seasons then those found in the Southern Hemisphere, but many animals not found in Australia. I decided to make this poster with information about Australian Moons specifically Western Australian moons, as I have become tired of seeing events to celebrate The Hunters Moon when we are in Spring not Autumn and the Wolf Moon when we are in mid-summer not mid-winter. I have created this using Western Australia seasons, like many parts of Australia, Western Australia has six seasons, not the commonly used four. These seasons also are not given a specific calendar start and finish date as with nature it is fluid and does not conform to our ridged calendar, calendar months have been used as a guide only. Traditionally the burning time of year. Fire is a very real force in the hot Australian bush, and its awesome power of destruction and creation is to be respected. Reptiles also shed their old skin for a new at this time. We can use this time to do the same. As we have grown from the experiences of the past year we she the old, to make way for the new. afternoons. In land is hot and dry. Still little to no rain with, hot easterly winds. Coastal waterways, rivers and estuaries being an important part of this time. Seeing an abundance of fish and animal life centered around these areas. Sees a break in the really hot weather, with cool nights and early morning dew. The winds have changed their intensity, with light breezes in a southerly direction with many flying ants can be seen flying around in the light winds..
collected and stored, along with the root bulbs, fresh water fish, frogs and turtles. Begins the coldest and wettest time of the year, marking a move back inland from the coast as the winds turned to the south/west bringing the cold weather, rains. Focus moves now to inland grazing animals such as the kangaroo. occasional sunny day or two. As the days start to warm up, we start to see and hear the first of the new born, and we’ll start to see the flower stalks of the Grass Trees emerge, if they have been burnt during the burning time of the year. As the days continue to warm up, many birds will still be nest bound, hence the swooping protective behavior of the Koolbardi (Magpie) starts to ramp up. We see an abundance of colourful flowers exploding all around us. Acacias, Banksias and many other smaller flowering plants including the Kangaroo Paw and Orchids. At this time you’ll encounter a snake as the reptiles start to awaken from their hibernation looking to make the most of the warm energy to assist them in looking for food. Many things are undergoing transformation with the warm change in the weather. it’s also time for the baby frogs to complete their transformation into adulthood. The name given to a full lunar eclipse, as the shadow on the moon has a red tint. The name given to a second full moon in a calendar month. Disclaimer: These are not Traditional Nyoongars Moon names. I am not of Nyoongars blood. The names for the Moons have come from my research and living in the area all my life.